Larry Sheppard, a volunteer with Operation Christmas Child, a project of Samaritan's Purse, delivers gift-filled shoe boxes to children in Costa Rica. LEWISPORTE— For Larry Sheppard, a volunteer with Operation Christmas Child, the chance to hand deliver the shoeboxes to children in Costa Rica was a real eye opener. As a volunteer coordinator for the past number of years with the Samaritan’s Purse initiative-aimed at having residents and groups fill shoeboxes for less fortunate children around the world-Mr. Sheppard knew the program was a good one. Having the chance to see just what it means to the children receiving the shoeboxes further enforced that commitment to the project. “I was more impressed with it than ever after seeing and experiencing this,” he said. Along with a group of 30 other Canadians (he was the only Newfoundlander), Mr. Sheppard travelled to Costa Rica from April 19-26, a trip he financed with his own personal funds. They assembled two groups to travel to villages-some remote-to deliver the shoeboxes to children at schools and churches. In many cases the children and their parents had to make quite a journey to get to the shoebox distribution point. “One mother told the team she had rode two hours down the mountains on her bike with her child on the crossbars to make sure they got there,” said Mr. Sheppard. While many of the children Mr. Sheppard met live in poverty, they also deal with issues of drugs, alcohol and child prostitution, sometimes involving children as young as age five. Ms. Sheppard noted that the children in the photos he supplied to The Pilot may look well dressed, but he said this was a special occasion and they made a point to try and look nice for the visitors. He noted that these “nice” clothes may be the only clothing they own of this quality, it is not the norm for them to wear. As he was handing out the shoeboxes to the children ranging in age from two to 14, Mr. Sheppard said at times it was an overwhelming experience. “They are so appreciative of everything they received,” he said. “I saw some shoeboxes opened containing everything from baseball gloves to clothing and hygiene items. He was quite touched by the generosity of the children. Speaking with classes from Lewisporte Collegiate after his return from Costa Rica, Mr. Sheppard said they had many questions, including if the shoeboxes are really the only gift some of them will receive this year, which is a reality for many of them. As a local distribution coordinator, Ms. Sheppard said people wonder why the shoeboxes are not all distributed at the same time during the Christmas season. With so many shoeboxes and so many children to reach in countries around the world, it is impossible to have them all delivered for Christmas. So the children receiving the shoeboxes on Christmas morning isn’t the most important thing, the fact that they receive them at all is. As a past distribution centre coordinator, Mr. Sheppard has received lots of questions in the past about Operation Christmas Child. People have asked him before if the shoeboxes ever really arrive in the hands of the children, and this was proof that they do. He looks forward to sharing his experiences and first-hand knowledge of the distribution of shoeboxes with people locally. It’s not just the shoeboxes that Samaritan’s Purse is involved in. Mr. Sheppard got to experience other levels of giving through this initiative such as supplying school supplies to a school where the principal was very appreciative because she had been stressed about the lack of supplies. Mr. Sheppard was able to pray with the principal, having his prayers translated. At each distribution stop there was an air of celebration as the volunteers helped serve meals to the children and took part in activities with them such as face painting, games, skits and making balloon characters. Mr. Sheppard said in some shoeboxes there are letters with return addresses. Volunteers like him could get a copy of that address and send a note or photos to the person who sent it to let them know a bit about where their shoebox was delivered and about who received it. Mr. Sheppard had the chance to do that and sent photos and a note to a school who sent a shoebox. He also had the chance to carry with him one shoebox to deliver himself. He could have chosen to deliver one he put together himself, but during the last Operation Christmas Child campaign he kept behind one of the shoeboxes put together by Lewisporte Collegiate student Desiree Nippard. He took photos of the little girl who received the shoebox from Desiree and presented it to her during his recent visit to the school. She was very happy, shedding tears of joy. Mr. Sheppard said all the students he spoke with were very interested in what he had to say about his journey, with some saying they would even like to do something like this themselves in the future. Mr. Sheppard encouraged them, noting that in his group there were participants right from age 11 to grandparents. Mr. Sheppard said people in his group were very caring. In one instance some volunteers made repairs to a pair of eyeglasses for one of the boys who had made the trip to receive a shoebox. Mr. Sheppard said the need is still great in terms of the number of children who could benefit from receiving an Operation Christmas Child shoebox. He explained that while shoeboxes will likely be delivered to Costa Rica in future years, they won’t visit the specific communities covered on this distribution trip again. “They (Samaritan’s Purse) look at it as one child, one box, one time,” he said. 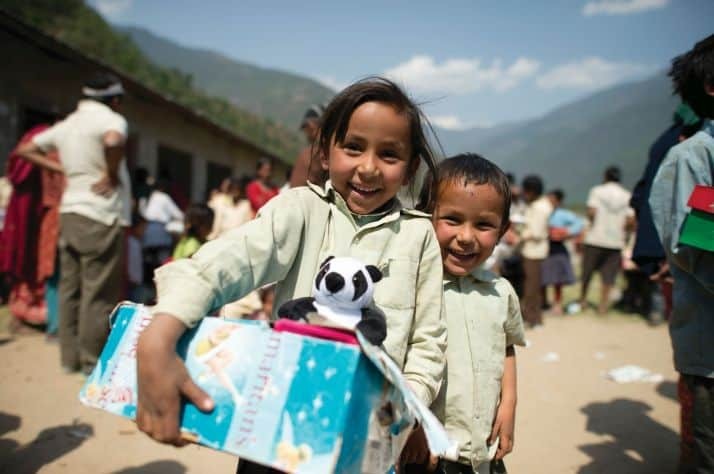 “They feel they will reach their one (hundred) millionth shoebox given out next year.